A Solar System on the roofs of homes and businesses uses energy from the sun to generate electricity cleanly and quietly to assist you in reducing your electricity costs and insulate you from rising electricity prices whilst at the same time making a big difference to the environment. When you’re producing your own power, you’re buying less from your retailer and selling your excess to them. You get a credit on your electricity bill for every kW you feed back to the grid (feed in tariff). Consider the following examples. If you have 3kW of devices running and you’re producing 2kW, after one hour you would have consumed only 1kWh instead of 3kWh, saving between 45c to 60c in that hour. If you’re producing 3kW and only using 2kW, after one hour you would have sent 1 kWh back to the grid and not purchased 2kWh, saving even more. Remember that kWh is “units” on your power bill. The solar industry benefits from a government incentive called the ‘Renewable Energy Target’ (RET). Under the Small-scale Renewable Energy Scheme, households and businesses with solar power systems up to 100kW, receive Small-Scale Technology Certificates (STCs) for every megawatt hour of renewable energy generated or displaced by an accredited solar panel. The quantity of STCs your PV system entitles you to is determined by the total size of the installed system and the solar zone of that installed system. 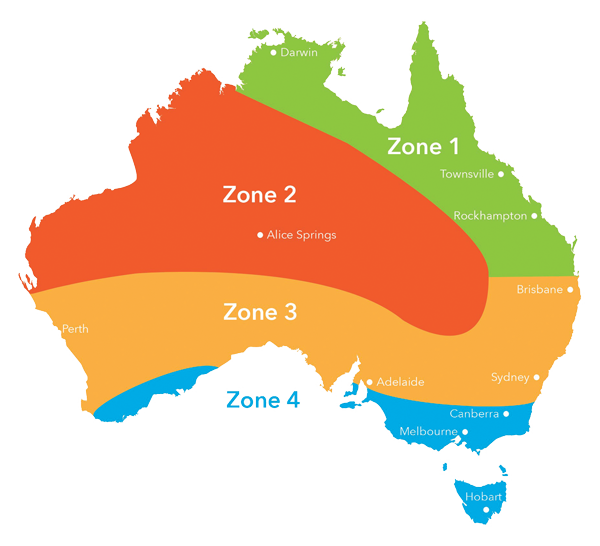 Australia is divided into 4 solar zones. Like shares, STCs have a trading value, which fluctuates depending on supply and demand. Small-scale renewable energy system owners and registered agents have the option to sell STCs through the open market for an uncapped price. Solar power is very simple. A usual residential solar system converts sunlight directly into electricity and is typically comprised of 5 main components. Those include Panels, Inverter, Mounting System, Cabling and Meter box/Switchboard. Solar Panels on your roof convert sunlight into DC electricity. A solar inverter then converts the DC electricity into 240V AC electricity for home use. Devices in your house will utilise the AC from the solar power system first and draw electricity from the grid if you need more. If you are producing excessive power, this is returned to the grid. Numbering anywhere from 6 to 54 panels (or more) and connected in series solar panels convert the sun’s rays into DC electricity. The inverter converts the DC electrical current produced by the solar panels into AC electrical current suitable for supply to your home and the electricity grid. The mounting system secures your solar PV panels to the roof. It is important to use a system that is designed to last a system lifetime. Using the right cables and minimising cabling distance ensures maximum efficiency of your system. Premium quality cable will maximize a systems efficiency. Your meter box and switchboard connect your solar power system to the electricity grid and enable you to participate in the energy buyback and feed in tariff schemes. Grid-Connect Systems with Battery Storage. Solar Battery back-up systems are becoming increasingly popular. They work similar to a standard grid-connected solar PV system with the addition of a battery inverter and a battery bank which enables you to use the electricity stored during the day to run your house at night. Some also have the advantage of being able to supply power during power outages. Sell energy back to the grid at peak times for a premium rate Contact us for more information regarding Battery Storage Solutions and find out if they will work for you.